Albuquerque, NM: To celebrate waking up in a king sized bed with six oversized pillows and a day off from the Benise tour, I've ordered a pot of coffee with extra cream from the Marriott room service. 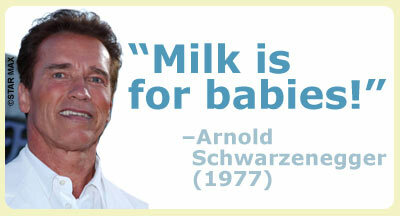 I pour a long drag of half & half into my mug and think two things: 1) Future Farmers of America 3) Arnold Schwarzenegger. Last Monday morning I woke up on the bus in Fresno, looked out the window, and saw swarms of high school students in blue and black uniforms streaming down the sidewalk and into the convention center, clasping folders to their chests, carrying BRIEFCASES at their sides, and jabbering away. "What do we have here?" I wondered. What we had there was the 78th California State Future Farmers of America Convention featuring an address by Governor Arnold Schwarzenegger. When I was outside asking Juan from the cleaners to please use a gentle cold wash, Arnold was inside taking back what he said in 1977 and trying to get on the good side of the 4000 future farmers in his audience who would be voting in a couple of years. It occurred to me that I was in a different California than the one I'd left the night before. The future farmers being herded around the block all day long were an extraordinarily clean cut-looking group of youngsters. While some of them may harbor secret hankerings for Reiki, hemp jewelry, and vegan cuisine, they all look very mainstream, as mandated in the official FFA Manual. The National FFA Organization is all about positive differences in the lives of students blah blah blah by developing their potential for leadership, personal growth and career success blah blah blah through agricultural science education. At public functions, members sport the FFA jacket zipped to the top with official FFA tie or scarf. Girls wear a black skirt of at least knee length, hemmed evenly across the bottom, with a slit no longer than 2 inches above the knee, and boys wear black dress pants. No jeans - blue or black - no leather, no pleather. I know this because I skimmed the FFA manual and I have one thing to say: PLEATHER!? I can't tell you how much I'd like to meet a little pleather-wearing future farmer and give him a handshake: "Son, you're really going to like Berkeley."